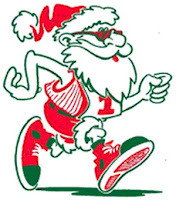 Our 2011 Holiday Run Schedule is now available. Highlights include the Quidi Vidi Christmas Run this Friday December 9, Tony's Boxing Day Run 9:30am Monday December 26, and Smitty's Run & Rum 5:30pm Friday December 30. Note that the Nautilus Center closes noon Friday December 23 reopening Wednesday January 4 so we have a few runs scheduled from Field House over the holidays.